Create a large open space in your classroom. “Stress in the lives of young people seems to be on the rise. Recent studies have shown that violence as well as alcohol and drug use have been identified by students as coping strategies for stress. The use of violence and drugs or alcohol actually creates more stress in your lives. It is important that we understand how this process occurs and identify healthier stress management techniques. Divide students into six groups of four to five people. Have each small group line up on one side of a masking tape line. The small groups should stand about three feet back from the masking tape line. Give the person in the middle of each line a balloon. Have them blow it up as large as they can and tie it off. Explain that the object of the game is a lot like volleyball without the net. Each group scores a point when a balloon touches the ground on the opposing group’s side of the masking tape. There are no out-of bounds so the balloons may be hit over the team members’ heads. The balloons may only be hit with hands. No kicking allowed. Have each small group identify one thing that causes them negative stress represented by the balloon. Explain that the play begins with the two people in the middle of each line hitting the balloon across the center line and that each round lasts for 20 seconds. Each small group may score as many points during the 20 seconds as possible. When the balloon hits the floor, a point is scored by the opposing small group and the balloon is put back into play by whichever player is closest to the side where the balloon landed. Each small group keeps his or her own score. Ask the group what questions they have. Reinforce proper hitting techniques. Begin. Keep track of the time and stop groups when 20 seconds have passed. Check the scores from each of the small groups. Have students rotate positions within their line so that they are across from a different person in each round. Have each small team add another balloon, representing additional negative stressors. Now there will be four balloons in play instead of two. Remind students of safety rules and then start a second round. When time runs out, check the scores. 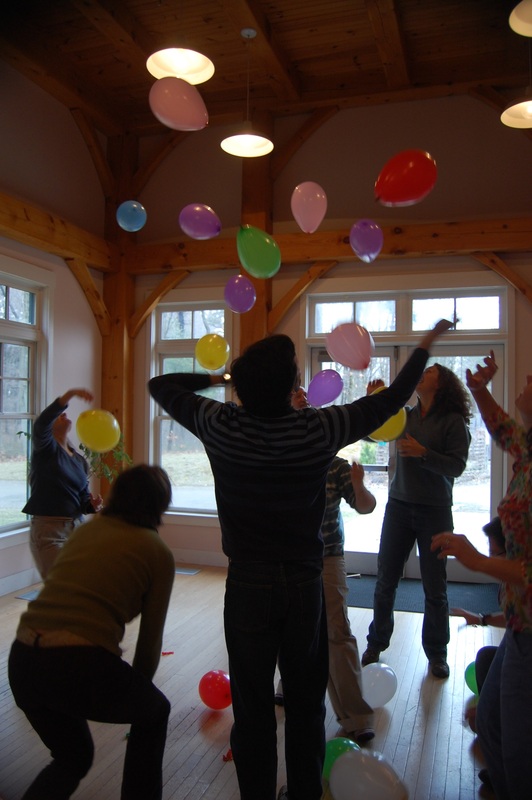 Keep playing rounds and adding balloons representing negative stressors until there are ten balloons in play. Have students stand with their small group, facing the center of the room and forming a circle. Explain that the activity is going to be debriefed by performing a group sculpture. This means that you will ask the class a question. Each small group quickly gathers together and positions their bodies in a connected ‘sculpture’ that represents the response to the question. Have each small group describe how their behaviors changed with the added stressors. For example, you noticed people hitting the balloons harder and speaking more intensely to one another. Relate this to conflict and violence. Have each small group identify one healthy option for managing each of the negative stressors identified on their balloons and then share out with the class. Record negative stressors and corresponding healthy management techniques on flipchart paper and keep them posted in the classroom. This activity needs to be monitored very closely. Be sure to reinforce appropriate play guidelines such as not hitting balloons at people, staying at least three feet away from the center line on either side. Stop the action if you see any group getting out of control. You will most likely need your whistle as the noise level gets very high! Set up a curvy path throughout the desks in the classroom. Make the turns challenging but not too tight as students will have to pass through the path while connected to one another. You could outline this path with masking tape or have desks line its edge. Pass out one balloon to each student and ask them to blow it up and tie it off. Offer assistance if they are concerned with blowing up balloons. Ask students to form a line with their small group, standing front to back, like a trolley. Have them place their balloons between themselves and the person in front of them. Explain that they can only use each other’s pressure to support the balloons—no hands, arms or legs. Explain that the challenge is moving the entire group through the path while staying connected to one another and not allowing any of the balloons to hit the floor. Have students place their hands on the shoulders of the person in front of them. The person at the head of the line will not have a balloon. If a balloon hits the floor, the group in question should stop, retrieve the balloon, and the student who was in the front of the line moves to the end. The group can then carry on from where they lost the balloon. Have the class form one large circle after each small group has finished the course. Keep an eye out for emotional responses and comments regarding appropriate touch. Divide class into smaller groups if you are concerned with the students’ ability to manage physical closeness of body positions. You can also place the balloons between the students as they stand side by side, if that is more manageable. Also, offer the option for students to be spotters if they are uncomfortable with the given body positions.